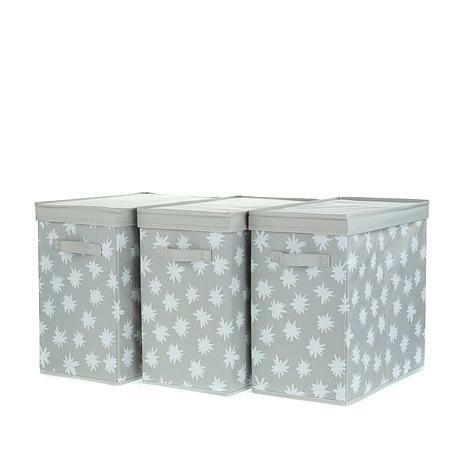 Get organized in style with this trio of cloth storage bins. 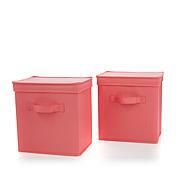 Each bin includes a lid to keep your out-of-season clothes, supplies, toys and more out of sight. Neat and tidy never looked so pretty. For use with Origami 4-Tier Large Rack (sold separately). Its durable and sturdy. The color is not exactly bright as they appear on the picture. 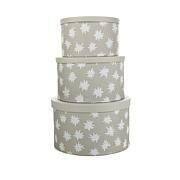 These storge bins are great to hold my husband's record album co llection. Just set them on a shelf and the recordsare protected. I also want to buy some for my craft room. I purchased the Bins in Teal. They are sturdy and look good. 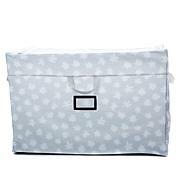 I am constantly searching for storage and organizational products because I live in a 250 square foot home and have to utilize all the space I can. These are great for a variety of things and are colorful as well. They are not an eyesore like so many storage units and are well constructed. This is my third set! Absolutely love these! Perfect size and the color is great!